Shiny new name for the Sea Ray? 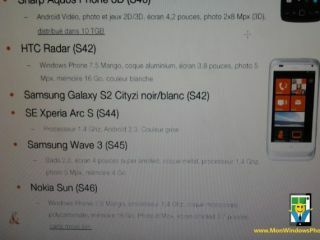 An internal product list apparently screen-grabbed from Orange France suggests that one of Nokia's first Windows Phone handsets will be named the Nokia Sun. will be three of Nokia's first Windows Phone handsets, Sun is a new one. Whether the Nokia Sun is a new codename to add to the list, the retail name for the Sea Ray or Sabre, or a red herring, we don't know. The mooted Nokia Sun specs include Windows Phone 7.5 software, a 1.4GHz processor, 16GB of memory, 8MP camera, 3,7-inch AMOLED screen and micro-SIM card. Those specs could relate to what we know of either the Sea Ray or the Sabre but for the memory – the Sabre is only said to be rocking 8GB of memory, while the Sea Ray comes with 16GB. Also the names are more related – Sea Ray, ray of Sun… see where we're going with this? Still, those leaked specs we're referring back to are in no way confirmed so don't take any of this as Nokia gospel. Orange France (if the screengrab is legit) lists the Nokia Sun release date as some time during the week of 7 November, which could be realistic given that we're expecting to see Nokia's first batch of Windows Phone handsets debut at Nokia World on 26 and 27 October.